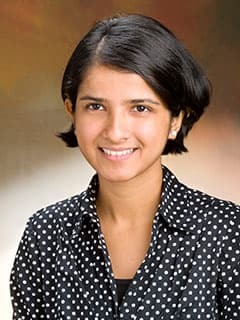 Lakshmi Srinivasan, MD, FAAP, is an attending neonatologist with the Pediatric Sepsis Program and the Division of Neonatology at Children's Hospital of Philadelphia. Dr. Lakshmi Srinivasan is an attending physician in the Division of Neonatology and the Pediatric Sepsis Program at Children’s Hospital of Philadelphia, and the Neonatal Intensive Care Units (NICUs) at Children’s Hospital of Philadelphia and Hospital of University of Pennsylvania. Dr. Srinivasan attended medical school at Madras Medical College in Chennai, India. After receiving training in Pediatrics at Children’s Hospital of Michigan, she completed her neonatal-perinatal medicine fellowship at Children’s Hospital of Philadelphia. She joined the faculty of the Division of Neonatology after graduation from fellowship, and went on to complete a Masters in Translational Research with an emphasis on design and conduct of patient oriented research studies. Her specific areas of interest include improving sepsis recognition and response in the NICU discovery of biomarker signatures for neonatal sepsis. Dr. Srinivasan is the CHOP physician leader hospital-wide for prevention of Central Line Associated Bloodstream infections (CLABSI). She also heads the CHOP NICU sepsis quality improvement workgroup, and has successfully led improvement work standardizing the response to sepsis and timely antibiotic administration in the NICU. She is currently guiding the development of a sepsis pathway to improve recognition and management of late-onset sepsis in the CHOP NICU. Along with Dr. Harris, she co-leads the NICU sepsis registry project (an ongoing automated repository of clinical data surrounding sepsis evaluations in the NICU), and is a co-investigator on the project led by Drs. Harris and Grundmeier to develop an early warning system utilizing the NICU sepsis registry. Her translational research investigations of biomarkers have included testing of broad range 16s rRNA bacterial PCR for diagnosis of neonatal infections, and development of diagnostic signatures using cytokines and Damage Associated Molecular Patterns. She has performed a pilot gene expression profiling study to better understand genetic risk and expression in neonatal sepsis. She was the lead investigator of the first genome-wide-association study of neonatal sepsis, performed through the NICHD Neonatal Research Network. She is presently performed a metaHer current research involves the investigation of integrated “omics” approaches for identification of diagnostic and prognostic tools in neonatal diseases. To this end, she is validating pilot data on transcriptomic profiles in neonatal sepsis, and embarking on a concurrent investigation of the metabolome in neonatal sepsis. Srinivasan L, Kilpatrick L, Shah SS, Abbasi S, Harris MC. Elevations of novel cytokines in bacterial meningitis in infants. PLoS One. 2018 Feb; 13(2):e0181449. Gordon SM, Srinivasan L, Harris MC. Neonatal Meningitis: Overcoming Challenges in Diagnosis, Prognosis, and Treatment with Omics. Front Pediatr. 2017 Jun; 5:139. Srinivasan L, Swarr DT, Sharma M, Cotten CM, Kirpalani H.: Systematic Review and Meta-analysis: Gene Association Studies in Neonatal Sepsis. Am J Perinatol. 2017 Jun; 34(7):684-692. Srinivasan L, Kilpatrick L, Shah SS, Abbasi S, Harris MC. Cerebrospinal fluid cytokines in the diagnosis of bacterial meningitis in infants. Pediatr Res. 2016 Oct;80(4):566-72. doi: 10.1038/pr.2016.117. Epub 2016 May 26. Padula, MA; Dewan, ML; Shah, SS; Padula, AM; Srinivasan, L; McGowan, KL; Mahoney, KR; Harris, MC. Risk Factors Associated with Laboratory-confirmed Bloodstream Infections in a Tertiary Neonatal Intensive Care Unit. Pediatr Infect Dis J. 2014 Oct. 33 (10):1027-1032. Read the abstract. Srinivasan L, Harris MC, Shah SS. Lumbar puncture in the neonate: challenges in decision-making and interpretation. Semin Perinatol 2012. Dec; 36(6): 445-453. Srinivasan L, Pisapia JM, Shah SS, Halpern CH, Harris MC. Can broad-range 16S ribosomal ribonucleic acid gene polymerase chain reactions improve the diagnosis of bacterial meningitis? A systematic review and meta-analysis. Ann Emerg Med. 2012 Nov; 60(5):609-620.e2. Srinivasan L, Shah SS, Padula MA, Abbasi S, McGowan KL, Harris MC. Cerebrospinal fluid reference ranges in term and preterm infants in the neonatal intensive care unit. J Pediatr. 2012 Oct; 161(4):729-34. Srinivasan L, Harris MC: New technologies for the rapid diagnosis of neonatal sepsis. Curr Opin Pediatr. 2012 Apr; 24(2): 165-171. Lorch SA, Srinivasan L, Escobar GJ. Epidemiology of apnea and bradycardia resolution in premature infants. Pediatrics. 2011 Aug; 128(2):e366-73. Srinivasan L, Evans JE. : Healthcare Associated Infections in the Nursery. Avery's Diseases of the Newborn 10th ed. 2017. Srinivasan L, Harris MC, Kilpatrick L.: Cytokines and Inflammatory Response in the Fetus and Neonate. Polin, Abman, Rowitch, Benitz and Fox, Fetal and Neonatal Physiology 5th ed. 2017. Kalb E, Coggins S, Harris MC, Ursula Nawab, Grundmeier R, Srinivasan L: Applicability of systemic inflammatory response syndrome (SIRS) and severe sepsis definitions to late onset infections in a quaternary NICU. (Poster presentations at Society for Pediatric Research, Toronto, Canada 2018 and Eastern Society for Pediatric Research, Philadelphia 2018). Schmatz M, Srinivasan L, Grundmeier R, Ostapenko S, Chilutti M, Harris MC: Surviving Sepsis in the NICU: Delayed Antimicrobial Therapy Worsens Outcomes. (Poster presentations at Society for Pediatric Research, Toronto, Canada 2018 and Eastern Society for Pediatric Research, Philadelphia 2018). Coggins S, Kalb E, Harris MC, Nawab U, Grundmeier R, Srinivasan L: Factors associated with delayed recognition of sepsis in a quarternary NICU. (Poster presentation at Eastern Society for Pediatric Research, Philadelphia 2018). Wu K, Srinivasan L, NICU Sepsis Workgroup at Children's Hospital of Philadelphia: Decreasing time to antibiotics in the neonatal intensive care unit. (Poster presentation at Eastern Society for Pediatric Research, Philadelphia, PA 2017). Schmatz M, Srinivasan L, Davis D, Grundmeier G, Ostapenko S, Chilutti M, Harris M C: Culture Negative Sepsis in the NICU: What Drives the Decision to Extend Antibiotics? (Poster presentation at Society for Pediatric Research, San Francisco, CA 2017 and Eastern Society for Pediatric Research, Philadelphia, PA 2017). Flannery D, Srinivasan L, Davis D, Schmatz M, Harris M C.: Challenges in Early recognition of Neonatal Fungal Sepsis. (Poster presentation at Society for Pediatric Research, San Francisco, CA 2017 and Eastern Society for Pediatric Research, Philadelphia, PA 2017). Barkwell V, Bezpalko O, Frye A, Gibbons MA, Powell S, Snyder M, Srinivasan L. Using a Bundle Element Approach in Pediatric Central Line-Associated Bloodstream Infections: Focus on CHG Bathing. (Poster presentation at Solutions for Patient Safety, Dallas, TX 2017). Wu K, Srinivasan L, NICU Sepsis Workgroup at Children's Hospital of Philadelphia: Decreasing time to antibiotics in the neonatal intensive care unit. (Poster presentation at Institute for Healthcare Improvement, Orlando, FL 2016). Srinivasan L, Watson D, Zhang Z, Rappaport E, Harris MC. : Gene Expression Profiling in Diagnosis of Neonatal Sepsis. (Poster presentation at Society for Pediatric Research, Baltimore, MD 2016 and Eastern Society for Pediatric Research, Philadelphia, PA 2016). Schmatz M, Srinivasan L, Tremoglie M, Grundmeier R, Perez A, Ostapenko S, Chilutti M, and Harris MC: Improvements in Timing of Antibiotic Administration in a Quaternary Care NICU: A One Year Perspective. (Poster presentation at Society for Pediatric Research, Baltimore, MD 2016 and Eastern Society for Pediatric Research, Philadelphia, PA 2016). Schmatz M, Srinivasan L, Grundmeier R, Tremoglie M, Perez A, Chilutti M, Ostapenko S and Harris MC: Antibiotic Use in the NICU: Do Comorbidities Matter? (Poster presentation at Society for Pediatric Research, Baltimore, MD 2016 and Eastern Society for Pediatric Research, Philadelphia, PA 2016). Srinivasan L, Gerhardt K, Rowan H, Rigby V, Minich C, Bodenstab H, Hadley S, Masten M, Schmucker K, Dysart K, Chuo J, Harris MC, Nawab U ,Munson D. : Improving Time to Antibiotic Administration During Sepsis Evaluations in the NICU: Adopting a Culture of Urgency. Poster presentation at Vermont Oxford Network, Chicago, IL 2016, Children's Hospital Neonatal Consortium, Kansas, MO 2016 and platform presentation at Patient Safety and Quality Day, Children's Hospital of Philadelphia, Philadelphia, PA 2016). Gordon SM, Srinivasan L, Abbasi S, Perez A, Tremoglie M and Harris MC: Analysis of Cerebrospinal Fluid Reveals Derangement of Metabolism in Infants with Bacterial Meningitis. Society for Pediatric Research 2016 (Poster presentation at Society for Pediatric Research, Washington, DC 2016 and Eastern Society for Pediatric Research, Philadelphia, PA 2016). Barkwell V, Bezpalko O, Frye A, Gibbons MA, Powell S, Snyder M, Srinivasan L.Using a Bundle Element Approach in Pediatric Central Line-Associated Bloodstream Infections. (Poster presentation at Institute for Healthcare Improvement, Orlando, FL 2016 and Patient Safety and Quality Day, Children's Hospital of Philadelphia, Philadelphia, PA 2016). Schmatz M, Srinivasan L, Grundmeier R, Chilutti M, Monk H, Ostapenko S, Perez A, Tremoglie M, Harris MC: Automated Neonatal Sepsis Registry: A Novel Approach to Understand Clinical Practice and Sepsis Related Outcomes. (Poster presentation at Society for Pediatric Research 2015). Schmatz M, Perez A, Srinivasan L, Tremoglie M, Ostapenko S, Grundmeier R, Chilutti M, Harris MC. Timing of antibiotic administration in neonatal sepsis: evaluating current practice and initiating quality improvement. (Poster presentation at American Academy of Pediatrics, Washington, DC 2015). Srinivasan, L. “Sepsis Management in the NICU: adopting a culture of urgency”. Invited presentation (webinar) to New Jersey Health Association and the New Jersey Sepsis Learning Action Collaborative, Jan 2018. Srinivasan L. “Quality Improvement Strategies to Reduce Late-onset Infections in the NICU.” Invited presentation at joint EBNEO 2017 and Indian Academy of Pediatrics Neonatology conference (IAP Neocon) 2017, Hyderabad, India, Nov 2017. Srinivasan L. “Culture negative sepsis: how much fact and how much fiction?” Invited presentation at Indian Academy of Pediatrics Neonatology conference (IAP Neocon) 2017 workshop on Neonatal Infections, Hyderabad, India, Nov 2017. Srinivasan, L. "Pause, Reflect, Go: Developing a CLABSI site visit strategy for internal assessent and external learning." Invited presentation (leader of 3 hour breakout session) at the Solutions for Patient Safety National Conference, Dallas, TX, May 2017. Srinivasan, L. "CLABSI Prevention: a revised approach and benchmarking summary." Invited presentation at the Solutions for Patient Safety Regional Conference, Children's Hospital of Pittsburgh, Pittsburgh, PA, Apr 2017. 2011-present, Associate member, Institute for Translational Medicine and Therapeutics, University of Pennsylvania.